This code begins generation of the CSR and Private Key File. The system prompts you to add the common name, this is where you add your domain name. When the system prompts you to add the organization information along with the location, add the full address or location of your business. The Private Key and CSR are now generated and named: server.key and server.csr. Change their name and Save them into a specific location; change the name todomain.key and domain.csr file name. Log in to your FileZilla Server. Click SSL/TLS certificate in the bottom left corner. Mark FTP over SSL/TLS support (FTPS). Now find and select the Private Key file and SSL Certificate file. 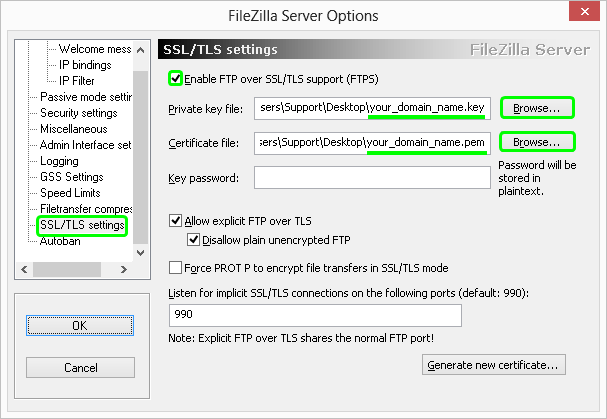 Your SSL Certificate is now installed on your FileZilla Server.